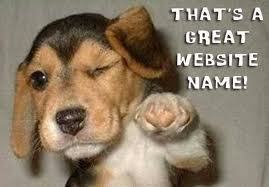 I was searching for a right website name for my Venture and trust me it is like a never ending task. It is not like that I am registering domain for the first time but when you are looking for a long term perspective, it seems challenging. The good thing is that I learned how to ease this task and I'll share few of my tips. 1. Pick out three keywords which is directly related to your business. For instance if you are trying to do automobile consulting, you can pick auto, automobile, machine etc. Next, you can add prefix or suffix to the name. The greatest advantage is that it will be in accordance with keyword search on any search engine. 2. Make your domain unique- Similar names causes confusion as well as low ranking on search engines. Unique websites name generally get better rank in searches & it is easy to market the websites as well. 4. Keep the website name short, easy to remember and if you are focusing on specified location, you can also add local lingo as well to spice it further. This is really useful, if you are concentrating local market for your business. 5. Take opinions from your peers (Clients, friends) , and ask them what do they think when they hear this name. If 50% of responses take a closer guess to the application of website, it means u r on your way!!! 6. There are pros and cons of using hyphen and numbers. You can get your desired name. Cons:- It is difficult to type and not easy to convey someone verbally. 7. Avoid copyright infringement- Try to get domain from registered sellers with ICANN- Go Daddy, Google Partners, Big Rock. They will also let you check the availability of domains. These resellers also facilitate the auctioning of domain names. 8. If you are not sure, register 2-3 websites name, it will cost you around 10$ per domain name, if it is not on auction or already acquired by resellers.